Persephone, a Greek goddess known in her childhood by the name Kore (or Cora, meaning young maiden), was the only child of the union of Demeter (goddess of the bountiful harvest) and Zeus, the mighty king of the Olympians. The Greek goddess Persephone was born when Demeter was Zeus' consort, long before his marriage to the goddess Hera. 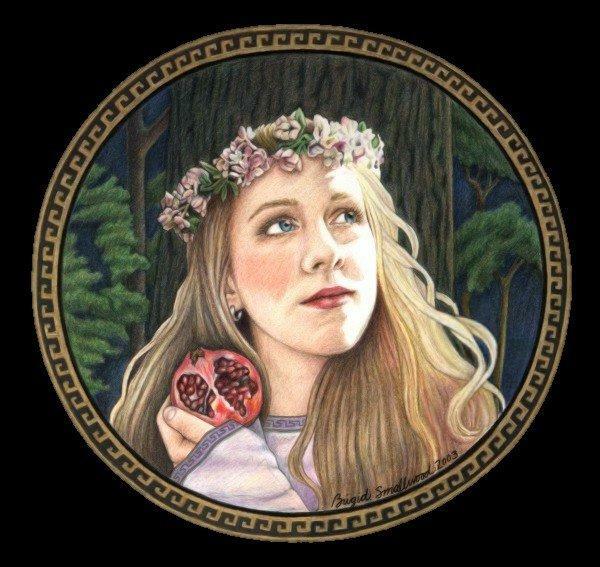 By all accounts Persephone had an idyllic childhood, raised by her nurturing mother and played with her father's other daughters, the Greek goddesses Athena and Aphrodite. Always a cheerful and compliant child, the little goddess Persephone was a parent's dream. According to Greek mythology Persephone's life was soon to change. As signs of womanly beauty began to shine along side her childlike innocence, the adolescent goddess Persephone unwittingly attracted the attention of the Greek god Hades, brother of Zeus and ruler of the underworld. One can hardly blame Hades because the underworld, in Greek mythology, was the realm of the sleeping and the dead. It probably needed some "brightening up", and the young goddess Persephone's radiance would assuredly liven up the place. The god Hades, however, did not bother to woo the young Persephone, traditional goddess protocol notwithstanding. After asking for (and receiving) her father's approval for Persephone's hand in marriage, Hades simply abducted her one bright sunny day when she stooped to pluck a narcissus from a field of wildflowers near her home. The meadow was suddenly rent open, and Hades simply reached out and snatched Persephone away, taking her to his underworld kingdom and making her his queen. Although the young goddess Persephone grew to love Hades, she remained lonely for her mother and the life she'd known on earth. Her mother, the goddess Demeter, had heard Persephone's screams when Hades grabbed her. She began an intensive search for Persephone. After learning how Zeus had betrayed their daughter, and consumed by grief and sorrow, Demeter demonstrated her outrage by withholding her blessing from the earth until Persephone was returned to her. Droughts ensued, and the earth lay barren. Mankind was facing a major famine. Zeus finally relented and sent the god Hermes to bring the young goddess Persephone back to her mother. Part of Persephone missed her mother horribly, but another part had grown rather fond of the god Hades. And Persephone was rather enjoying her role as Queen, even if it was in the underworld. While preparing to return to the earth with Hermes, Persephone accepted a pomegranate offered to her by Hades. She knew full well that anyone who had eaten while in the underworld would not be allowed to return, even a goddess -- Persephone went ahead and ate seven of the seeds. Her choice prevented her from ever being fully restored to Demeter, but did open up the possibility of a compromise. Hermes was able to negotiate an agreement on her behalf between Hades, a god who was usually rather cold-natured and self-centered, and Demeter. Persephone would be allowed to stay with Hades in the underworld for four months each year (winter) and would return to the earth and her mother the remaining months. The goddess Persephone was soon reunited joyfully with her mother. Each year as Persephone left to join her husband in the underworld, Greek mythology tells us that the goddess Demeter would begin to grieve, bringing on the cold, barren winters. But a few months later Persephone, the goddess associated with awakening, would return to bring spring and its verdant growth in her wake . . . thus were the seasons established. Not that the goddess Persephone sloughed off any of her responsibilities as the Queen of the Underworld . Apparently Persephone didn't spend all her time "going home to momma". Having made the decision to consume the seeds of the pomegranate while in the underworld, Persephone managed to somehow always be there when others came visiting, ready to receive them into the underworld and to serve as their hostess and guide. The goddess Persephone, Queen of the Underworld, was willing to help Psyche pass Aphrodite's tests so that Psyche could be reunited with her beloved husband. Psyche had been assigned to go to the underworld and return with some of Persephone's famous youth serum/beauty ointment (actually it was a sleeping potion, but hey, we all know what a bad night's sleep can do to our appearance!) While Psyche was in the underworld, she found Persephone to be both a gracious and generous hostess. The Greek goddess Persephone also helped Heracles (Hercules), loaning him Cerberus, the ferocious three-headed dog that guarded the entrance of the underworld, so that he could complete the Twelve Labors he'd been assigned to make retribution for the death of his wife. The goddess Persephone was also at home in the underworld when Odysseus (Ulysses) arrived. She rewarded him with a legendary tour of the souls of women of great renown. Eventually, Zeus had to step in to settle the argument. He ruled that Adonis should spend a third of the year with each of the goddesses, Persephone and Aphrodite, and be left to his own pursuits the remainder of the year. Unfortunately, Adonis chose to spend his free time hunting and was killed in a hunting accident a few years later. The Greek goddess Persephone represents both the youthful, innocent, and joyous maiden aspect of a woman as well as the more womanly self who, innocence lost and family attachments loosened, can begin to consciously decide for herself. • Persephone, help me give full attention to the moment I am in so that I do not miss valuable opportunities that come my way. • Support me, Persephone, so that I can be more supportive, good-natured, and receptive to others. • Great Goddess, remind me that my value does not depend solely on compromising just to please other people. • Persephone, help me to accept others as they are. • Goddess, let me be a loving and forgiving person. • Today is my chance to be healthy and happy. • Great Goddess, I give myself credit for knowing what is best for me. • Persephone, lend me your ability to experience joy in life, greeting each day knowing that my life is full of amazingly wonderful surprises. • I allow myself to march to the beat of a "different drummer", not always trying to remake myself into somebody that I think is what others expect and want of me. • Persephone, teach me how to trust my intuitions and follow my own path. • Help me remember that the times of greatest sorrow also lead to the moments of greatest growth. • Persephone, lend me your ability to sense an invisible spirit present in the world, and allow me to stay connected to my past while my life undergoes changes and upheavals.